Our fellow Recipe Clubber, Kat, sent me this great recipe for a light, coconutty curry full of great vegetables! This is a perfect meal for Kaphas when watering down the coconut milk, and for Pittas when omitting the pungent spices. Serves 4. Roast the coriander seed in a dry frying pan, then cool and grind finely in a spill mill or by hand with a mortar/pestle. Combine the garlic, ginger and jalapeño and mash together to make a smooth-ish pulp in a mortar/pestle or small food processor. In a pot or wok with lid, heat the oil and fry cumin seed for 30 seconds. Add the mixture of garlic, ginger and jalapeño, plus the turmeric. Add ground coriander and cook for a few minutes. 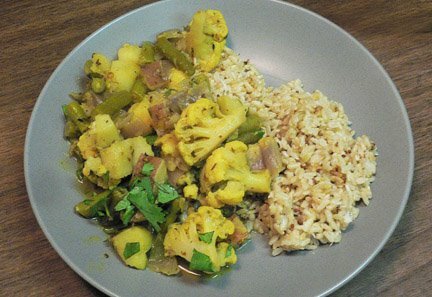 Mix in cauliflower, green beans, potatoes and onions, and stir to coat with spices. Add the coconut milk and a little bit of water if necessary, and season with salt. Bring to a boil, then cover and cook gently until tender, about 25 minutes or more on low heat. Before serving, remove from heat and stir in mint, cilantro and add lemon juice to taste. Adjust salt or seasonings and serve with coconut basmati rice and salad. Toasting and frying spices makes their flavour and fragrance explode! It is common practice in Indian cuisine to fry whole or ground spices in oil or ghee, then stirring it in to a cooked pot of dahl or curry. o o o For a flavourful coconut rice, cook with grated coconut, a cinnamon stick, mustard seeds, cumin seeds, a bay leaf, and/or a black cardamom pod. Also, I find basmati cooked on a stove top is much better than in a rice cooker, which tends to over-boil the rice and dry it out.